Back to Green Valley and to a course that is still in beautiful condition. We are still having a strong showing of 24-32 golfers most Monday’s which is a good turnout for low season. We have our regular 9:28 tee time and today we got off right on time. Today’s leaderboard got a bit congested with ties for 1st and 4th, and all with respectable scores. It was Muffy Kerr and Lothar Egger who ended up at the top of the heap with 38’s on the card. There was a tight finish as Rick Allison, playing off a 2 handicap, was a shot back and Kenny Aihara, playing off 3, one more down at 36. Billy “The Hat” Eyles was hangin’ tough with the low handicappers and also finished strong, shooting his handicap at that 36 mark as well. What a great golf course this is and this time we finally got to get out on the C track for a change. We had beautiful weather all day, but late on the back 9 the clouds formed and we just got off the course as a light mist started to fall. Good thing we had that 9:36 tee time for our 5 groups! This time out, we got to welcome Darren Muddle from Oz to the ranks. It was his first time to play this course and a 35 was a very good scorecard to turn in for a third place spot. Wonky shoulder or not, Kenny Aihara managed to shoot his handicap and a 36 got him sole second place. After winning on Monday, you gotta say he was in his Purple Patch as Lothar Egger took another victory from the TGC crew. Oh dear, pouring rain was pounding on the windscreen of the Commuter as we hit the highway just outside town. It was non-stop precipitation all the way to the course but as (good) luck would have it, we were blessed with a sunny tee off as well as for the rest of the round. This has been a fairly easy write-up this week as both Lothar and Kenny were “copy & paste” for all 3 rounds! Unfortunately, Lothar is making his way back to Germany, Jimmy Dundon is already back to the States, Stevie Mulberry and Snelgrove gone and Rick Allison is homeward bound to Oz. It’s a good thing we have some fresh blood with Mutzie in town and sure to make a podium appearance next week! 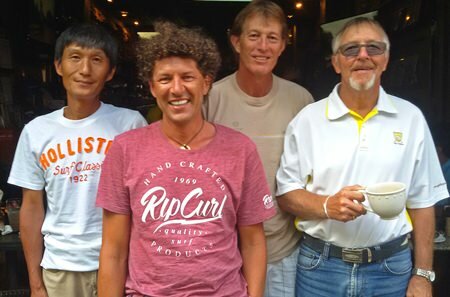 (Left-right) Kenny Aihara, Lothar Egger, Rick Allison and Bill Eyles. Back to the results and Kenny is back! After a few rough weeks on the disabled list, Mr. Aihara done good this week with a win and 2 other podium finishes. A good fortnight’s rest seemed to work wonders, but he still has a dodgy shoulder to reckon with, so good luck with that buddy. 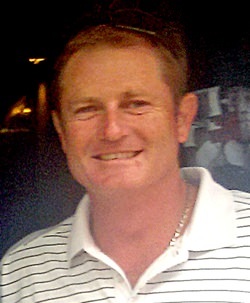 Look who slipped right in there at second place, the nicest guy in Pattaya… Mr. Dave Ferris! Dave has been invaluably helpful with looking after the caddies we have brought to the dentist for work on their teeth as part of our “Caddy Smile” program. If you meet a local caddy who seems to need help, please let Dave or Phil know. Taking third spot, yes, it’s the same Lothar once again as he ended his Pattaya golf holiday with another great round. Time to give the other guys a chance! Note: The Golf Club is located on Soi LK Metro. 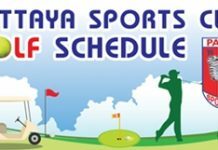 Just call 085 434 3377 or see our website www.golfclubpattaya .com and for more information mail us: [email protected] and see updates at www.facebook.com/golfclubpattaya… all handicaps welcome!